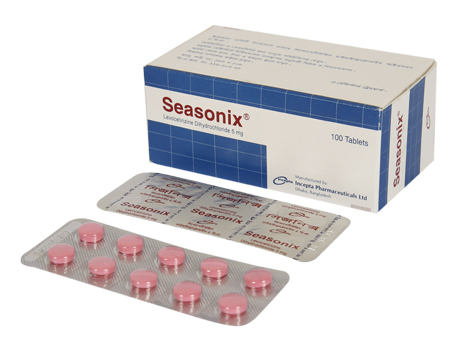 Seasonix : Each film-coated tablet contains Levocetirizine Dihydrochloride INN 5 mg.
Seasonix oral solution: Each 5 ml solution contains Levocetirizine Dihydrochloride INN 2.5 mg.
Seasonix tablet is a preparation of Levocetirizine Dihydrochloride. Levocetirizine is the active (levo) isomer of Cetirizine. 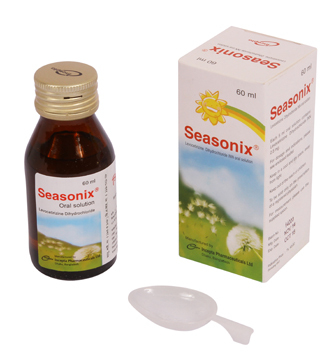 It is a new highly effective and well-tolerated non-sedating antihistamine with potent antiallergic properties. It has a two-fold higher affinity for H1-receptors than Cetirizine. Levocetirizine has a rapid and long-lasting action, allowing once-a-day administration. Pregnancy: The safety of Levocetirizine in pregnancy has not been established. Therefore, it should be used with caution during pregnancy and only if the benefits to the mother outweigh any risks to the fetus. Lactation: Levocetirizine passes into breast milk. So, it should be used with caution in nursing mothers and only if the expected benefit to the mother is greater than the possible risk to the nursing infant. Not recommended for use in children less than 6 years of age.